Our facility is open Monday through Friday and by appointment on Saturdays. Joint replacement is becoming more common, and hips and knees are the most commonly replaced joints. In 2006, 542,000 total knee replacements and 231,000 total hip replacements were performed. The new joint, called a prosthesis, can be made of plastic, metal, or both. It may be cemented into place or uncemented. An uncemented prosthesis is designed so that bones will grow into it. First made available in the late 1950s, early total knee replacements did a poor job of mimicking the natural motion of the knee. For that reason, these procedures resulted in high failure and complication rates. Advances in total knee replacement technology in the past 10 to 15 years have enhanced the design and fit of knee implants. 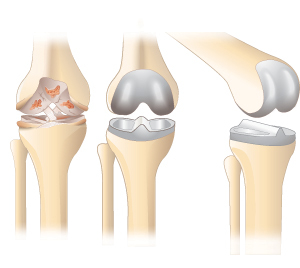 Total knee replacement is often the answer for people when x-rays and other tests show joint damage; when moderate-to-severe, persistent pain does not improve adequately with nonsurgical treatment; and when the limited range of motion in their knee joint diminishes their quality of life. In the past, patients between 60 and 75 years of age were considered to be the best candidates for total knee replacement. Over the past two decades, however, that age range has broadened to include more patients older than 75, who are likely to have other health issues, and patients younger than 60, who are generally more physically active and whose implants will probably be exposed to greater mechanical stress. About 90 percent of patients appear to experience rapid and substantial reduction in pain, feel better in general, and enjoy improved joint function. Although most total knee replacement surgeries are successful, failure does occur and revision is sometimes necessary. Risk factors include being younger than 55 years old, being male, being obese, and having osteoarthritis, infection, or other illnesses. There are a number of reasons why you should see a physical therapist before you consider a knee replacement and after surgery as well. Physical therapy is proven to be a successful treatment for arthritis; therefore, a physical therapist directed program could help you delay or avoid knee replacement. Seeing a physical therapist before surgery and going through a "prehab" program (a set of rehabilitative exercises before surgery) is proven to increase strength and speed the post-surgical recovery process. Post-surgical physical therapy for knee replacement patients is a must. While most knee replacement patients experience a significant reduction in pain, almost all knee replacement patients suffer from considerable muscle weakness, loss of range of motion, and limited function. Seeing a physical therapist after surgery can greatly improve your strength, mobility and function. Give us a call to learn more about how we can help you.